Disruptive office noise is something that we’ve all experienced before. Reduce stress and create a happier, healthier workplace with these 3 office noise solutions. Studies into the preferences of office workers in recent years have consistently uncovered one thing: people crave privacy at work. The acoustics of your workplace are fundamental in providing privacy (or not providing it!) for your staff. Whether your employees work in a large open plan office or share a space with one other person, privacy is something that everyone needs from time to time. Not feeling that you can have privacy can be a source of stress, something which is unfortunately all too prevalent in the modern workplace. Steelcase have explored, what they call, the workplace ‘privacy crisis’, commenting that “too many workplaces today aren’t delivering on privacy as a necessity”, and we see this as a major problem. 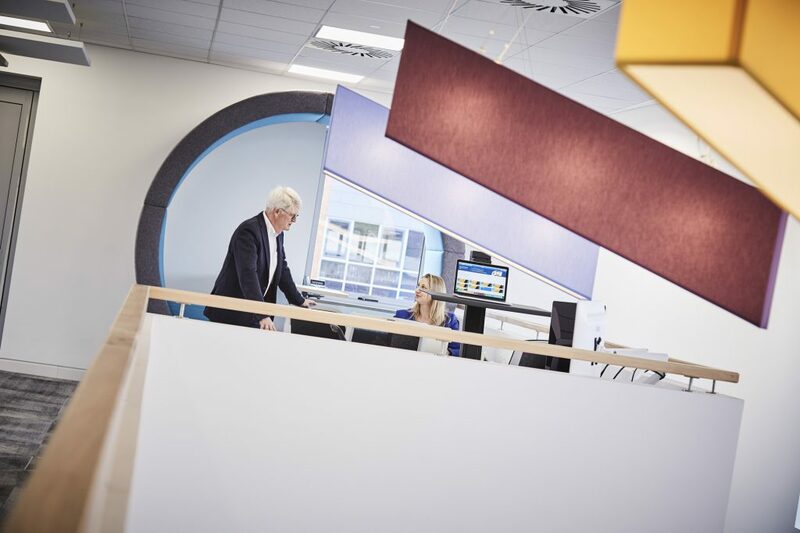 Whilst there is no one answer to solving this problem, clever and stylish acoustic solutions that reduce the noise in your office space can go a long way to increasing the privacy that your staff can choose to have at work. Read on for some of our favourite office noise solutions. Using glazing to replace walls in meeting rooms is a popular option as it gives the occupiers acoustic privacy without creating a dark or claustrophobic environment. Glass can, however, cause reverberation which can prove problematic for situations such as video or conference calls where optimum sound quality is required. Introducing freestanding sound absorbing totems into your meeting room requires minimal space and budget. As the name suggests, these totems are freestanding, meaning they require no installation and can be moved easily to improve the sound quality in a space. Some totems can reduce background noise in a meeting room by up to 50% per 10 square meters. We use these totems in our small meeting room at WorkLife Central, and the improvement in the quality of sound is instantly noticeable when the totem is placed inside the room. Totems aren’t the only great solution for use in a meeting room environment, but they are one of the easiest to ‘install’ if you’re looking for an instant fix. One of our favourite acoustic solutions! People talk at work. Whether it’s to make a phone call to a client or to discuss work with a colleague sat opposite, it’s inevitable. After all, the workplace would be a very dull and unproductive place to be if no one spoke to each other all day! The issue comes when your office has been designed in a way that carries the sound of these conversations further than the immediate vicinity, disturbing colleagues, causing an inability to concentrate and all sorts of other issues. That’s right, you can drastically reduce office noise using furniture alone. Fabric-heavy furniture such as lounge chairs are not only good for providing your employees with a space other than their desks to meet or relax, but many designs are naturally sound absorbing too. 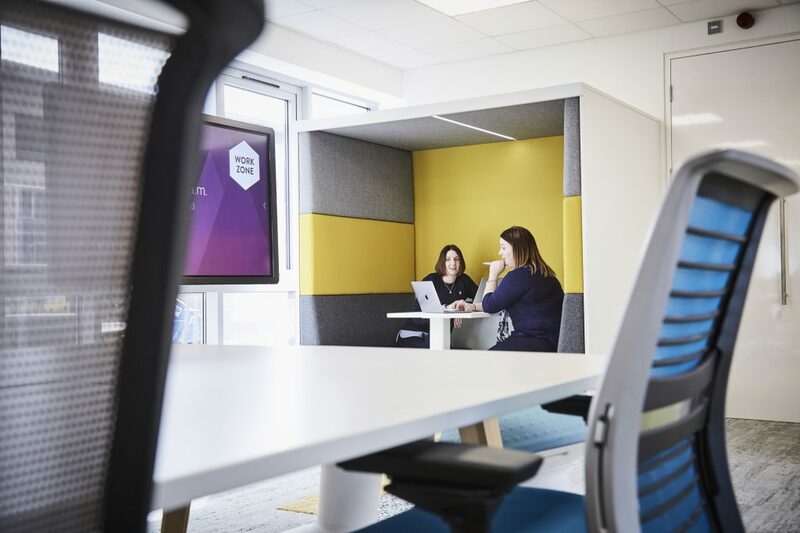 High back sofas and meeting booths are another effective option if you’re looking to provide less formal (and less noisy for others) meeting space for your staff. These pieces are often designed specifically to offer a good level of acoustic privacy by containing the sound within the enclosed space, including power and data points for efficient lone working or conducting meetings. A study published by The Journal of Consumer Research found that a certain level of ambient or background noise can improve concentration, but that high decibel noises often cause a distraction from completing a task. While the perfect level of sound to aid productivity varies from person to person, taking steps to reduce overall noise levels in the workplace will also reduce the effects of intrusive noises if and when they occur. Sound absorbing panels have evolved massively, and what was once an entirely functional acoustic solution is now something that can be incorporated into any sleek workplace design. Acoustic panels come in a whole array of aesthetically pleasing designs from ‘wings’ that can be hung from a vaulted ceiling to panels for wall mounting. Our own offices at WorkLife Central are full of potentially problematic sound-enhancing surfaces and structures from the double height ceiling to the glazed building façade. Sound absorbing panels are in use throughout, and effectively work to create an acoustically healthy space. Is your office too noisy? Let our experts help. 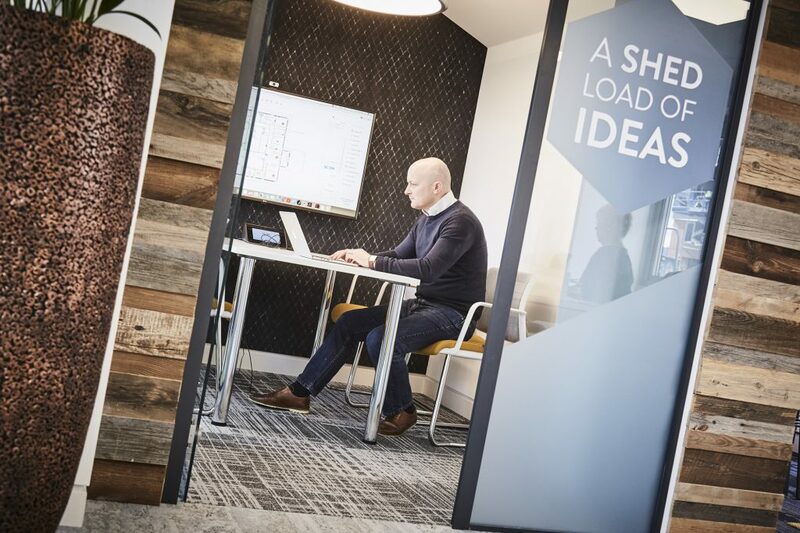 If you’re struggling to create an environment where your staff can concentrate and have privacy when they need it, talk to us about transforming your space for the better.